AgentsofAmerica.ORG® (AOA) and West LegalEdcenter, a business of Thomson Reuters, is pleased to announce that Book Three in the series “Insurance Agency Risk Management: E & O Exposures By Line of Business” is now available. AgentsofAmerica.ORG® (AOA) and West LegalEdcenter, a business of Thomson Reuters, is pleased to announce that Book Three in the series “Insurance Agency Risk Management: E & O Exposures By Line of Business” is now available. As with Books One & Two the content for this book was a collaborative effort of many of the top Agents, E&O experts, and attorneys in the United States and addresses many of the key issues in risk management, loss prevention, and litigation relating to claims against insurance agents and brokers. See Table of Contents. AOA is grateful to the publishing firm of Thomson-Reuters, a leading publisher of Insurance Agents loss prevention material. West LegalEdcenter, a business of Thomson Reuters, wants to be leader and influencer for agents and brokers in continuing education. This book series encompasses the materials agents and brokers are looking for and need to effectively understand and manage their E&O exposures. 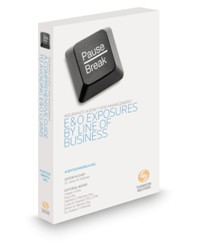 Not only does Book Three provide a solid in-depth review of the E&O exposures of the various lines of business with details of risk management and risk-avoidance guidance for the insurance professional, it also includes a host of best practices to minimize the potential for an agent facing E&O litigation. For lawyers prosecuting or defending claims against agents, it also provides comprehensive discussion of the legal issues that may arise in such claims and how the various states treat those issues.. Available now for $49,99. Save additional 20%! Enter promo code WPD20 at checkout and the discount will be applied. To Order CLICK HERE. AgentsofAmerica.ORG is extremely grateful to its authors and editorial board for their support and expertise. In addition to E&O Insurance expert Curtis Pearsall, the members of the AOA’s Editorial Board includes, Editor in Chief, Dr James Kallman of St. Edwards’ University, Minneapolis E&O defense attorney Britton Weimer of Jones Satre & Weimer PLLC, Professor Andrew Whitman of the University of Minnesota’s Carlson School of Management, Roy Little, President and CEO at Insurance Educational Association, Angelo J. Gioia Founder & Publisher of AgentsofAmerica.ORG, Matthew Marrone defense attorney with Goldberg Segalla LLP in Philadelphia and Frederick J. Fisher, J.D, President at Fisher Consulting Group. Companies or Agencies interested in purchasing multiple copies of each of the three books or who have questions about our programs should contact Angelo Gioia at angelo@agentsofamerica.org. To assist carriers, agencies or associations, looking to buy multiple copies we are providing significant group discounts, as low as $20 per copy. AgentsofAmerica.ORG is an Insurance Association dedicated to the personal and professional growth of its Insurance Agents & Brokers members and their agencies and a indispensable resource for news, products, services, continuing education, and industry information throughout America The organization's mission is to deliver the BEST people, products, information, and services to agents all designed to help them manage and grow their business and provide ongoing value to their clients. In addition, it has become the number one resource for connecting insurance agents with industry professionals, support and guidance on Professional Liability Risk Management, Errors & Omissions Risk Management, Loss Prevention & Loss Control, Insurance Agency revenue building products and opportunities. Our motto is "Bringing the BEST Together.” Visit Agents of America.